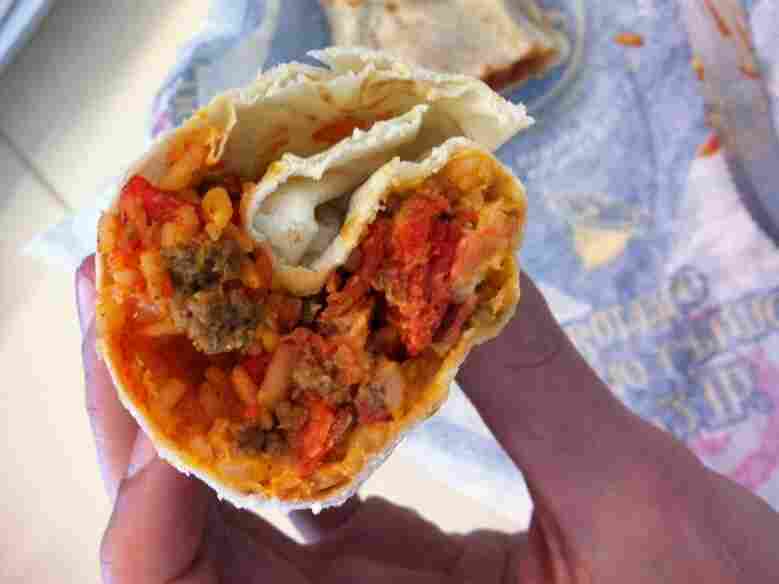 The 'Taco Bell Tantrum': Here's How It Went Down : The Two-Way Outraged over having to pay an additional 50 cents for each Beefy Crunch Burrito, a man in Texas allegedly fired air guns and led police on a chase that ended when tear gas was fired into his hotel room. Now he's in jail and his bail is $50,000. The meal at the center of this story: a Beefy Crunch Burrito. There's at least one story every day that's just so weird it gets lots of attention — even if it isn't important in any way, shape or form. As host Steve Inskeep said on Morning Edition, when a man in San Antonio heard this weekend that the seven Beefy Crunch Burritos he'd just ordered at Taco Bell had gone up in price by 50 cents each, "it was just too much." He allegedly fired an air gun at an employee and then took off. Police pursued him. More weapons were brandished. A standoff ended with tear gas being fired into a hotel room. Fortunately, no one was hurt. If you really want to know more — and get a sense for how badly this whole thing could have gone and how lucky it is that neither Ricardo Jones (the guy who's now under arrest) or anyone else was hurt or killed — the San Antonio Express-News has a long account here. As it turns out, the newspaper says, the "assault rifle" that Jones allegedly pointed at officers at one moment was a BB gun. Now, a dispute that began over an additional $3.50 charge for burritos has Jones sitting in jail. His bail: $50,000. And he's not, presumably, getting Beefy Crunch Burritos for lunch.